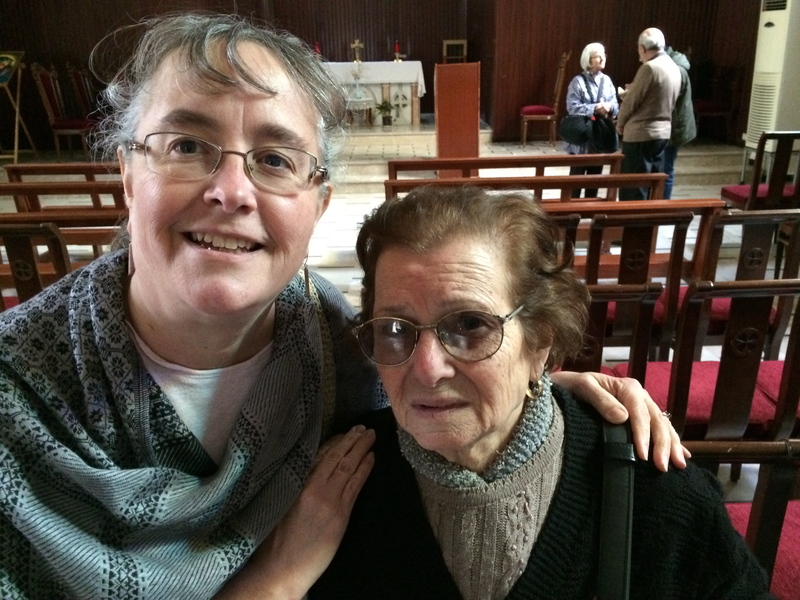 With one of the parishioners inside St. Maroun Maronite Catholic Church in Homs, Syria. I grew up as a Roman Catholic. Baptism. Confession. Communion. Confirmation. These four sacraments I received in the church I was born into and I am so grateful for parents who showed me this way. As a Roman Catholic, we made a pilgrimage of prayer each Good Friday at our church through the Stations of the Cross. We walked the Via Dolorosa, the way of tears, as part of our penance during Holy Week. In a remembrance of the actual events, we were walking in holy places, on holy ground. The old city of Homs, Syria, from the rooftop of a bombed mosque. I have made another pilgrimage of prayer as a Presbyterian. I have walked in a city where war has raged for over three years. I have walked in a city where a two-year siege was lifted only six months ago. I have seen damage and destruction and piles of rubble around every corner where our cars drove so we could make it to holy sites. Piles of rubble guarded by men with guns to protect the few people who have made the difficult journey home to see what is still standing. I have walked in the old city of Homs, Syria. I came here with six other American Presbyterians. People like me who go to church on Sunday to worship the Lord who saved us by his grace. We come from different places in the states, but we all belong to Presbyterian churches. We walked these places today with Presbyterians from Lebanon and Syria, including the pastor of the Homs Presbyterian Church, also called the National Evangelical Church of Homs, a young gentle man whose name is Mofid Karajili. I first met Mofid in January in Lebanon at a consultation for the National Evangelical Synod of Syria and Lebanon and global partners supporting the relief effort of NESSL due to the war in Syria. He had made his way to be with us and share what was happening in his congregation. The church building had been destroyed during this siege, but the congregation – the gathered and sent Presbyterians of Homs – continued to meet in a home for the elderly in what he described as a safer part of Homs. Safer meant that insurgents and terrorists had not rooted themselves in the buildings in that part of this expansive region of Homs. But that did not mean that they did not hear the mortars and the guns. It also did not mean that people weren’t killed when shells exploded, because they were. It just meant they were not the frontline of this war. Mofid still commuted back to Beirut once or twice a month to continue his pursuit of a more advanced theological degree at the seminary there. His wife and children lived in Damascus (another safer place) while he continued to lead his flock in Homs. Faithful. Steadfast. Loving. Courageous. That is Mofid. But now in Homs, Mofid was our host as we made this pilgrimage. Surrounded by security guards and other Christians, many from Mofid’s church but also Catholic and Orthodox, we went from place to place to visit seven Christian churches in this very ancient city, all of which had suffered severe damage during this war and siege. I didn’t expect to find much hope here. But what I found overwhelmed my heart with the truth of my faith: resurrection always follows crucifixion. The churches here have been battered and bombed from within and without. It should have marked an end. But it really marked a beginning. A resurrection. And I was a witness. We were met today by the priest of each of these churches in the old city of Homs. We stood in their sanctuaries and heard their stories. We saw the holes in their roofs. We saw the metal frames where stained glass once refracted sunlight into rainbows of colors. We saw icons and sculptures whose faces had been mutilated. We saw doors now filled with cinderblock as the heavy wooden or iron ones needed to replace them are not available. We prayed together in different languages, but to the same God with the same fervency. We walked the stations of the cross, two stations for each church. Jesus is condemned to death. Jesus carries his cross. St. Maroun Maronite Catholic Church: The bells were being rung by a man at St. Maroun. He was pulling hard on the rope and his feet would actually leave the ground as he repeated the pulling over and over. I have never heard bells sound out so joyfully before! Jesus falls the first time. Jesus meets his mother. Msgr. 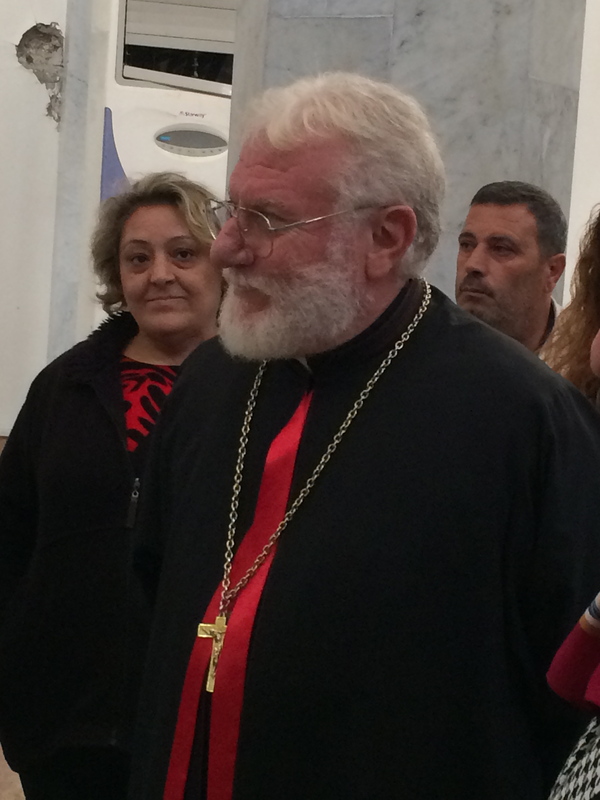 Kassab, bishop of the Syrian Catholic Cathedral of the Holy Spirit, Homs, Syria. At the Syrian Catholic Church of the Holy Spirit, the Syrian Catholic Bishopric, we had to hurry our visit as the priests there were preparing for a funeral. But we took time to pray the Lord’s Prayer there as a community of believers. Later, as we headed to the next church, we heard them before we saw them as they sang their mournful chants accompanying a procession from the church. Monsignor Kassab, dressed in the red colors of a bishop, smiled and greeted us at this church, explaining that they had been able to remove the remains of other bishops from this place before it was damaged. Simone of Cyrene helps Jesus carry the cross. Veronica wipes the face of Jesus. Fr. 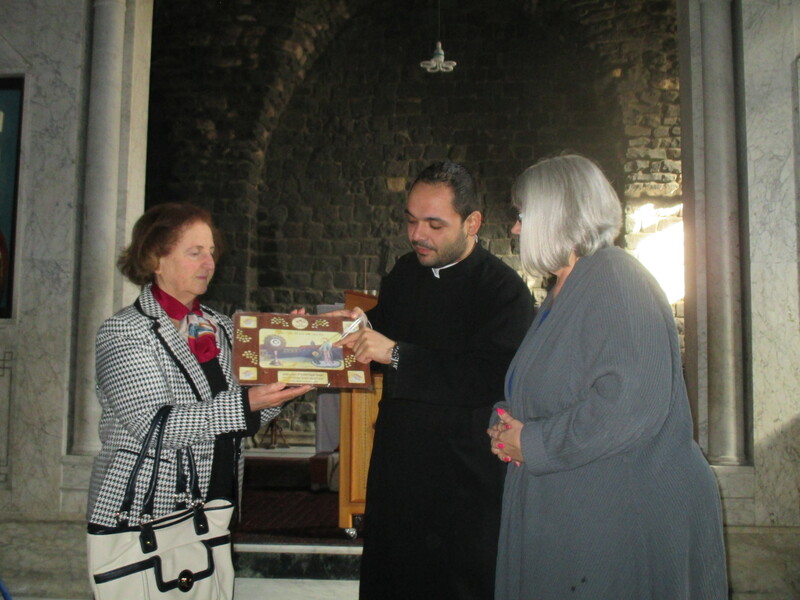 Ibrahim presents us with the gift of an icon at Notre Dame of the Belt, the Syrian Catholic Church in the old city of Homs, Syria. In the Syrian Orthodox church we heard the story of why they are called Notre Dame of the Belt. It seems the relic in this church is from the belt that the mother of Jesus wore around her waist. This relic touches the past in a very physical way. A very special gift at this church was hearing the priests sing the Lord’s Prayer in Syriac, as close to the Aramaic language of Jesus that still exists to this day. Fathers Anthony and Ibrahim led this beautiful sung prayer. Jesus falls the second time. Jesus meets the women of Jerusalem. 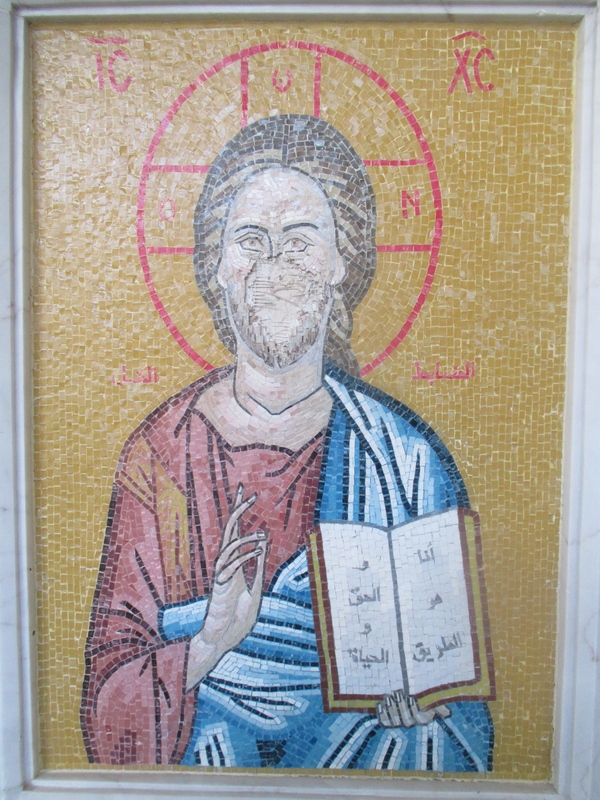 Mutilated face of Jesus Christ on a mosaic at the Greek Orthodox Cathedral of the 40 Martyrs, Homs, Syria. At the Greek Orthodox Church of the 40 Martyrs the Father Spyridon told us that bone relics of some of these early martyrs of this church are kept here. 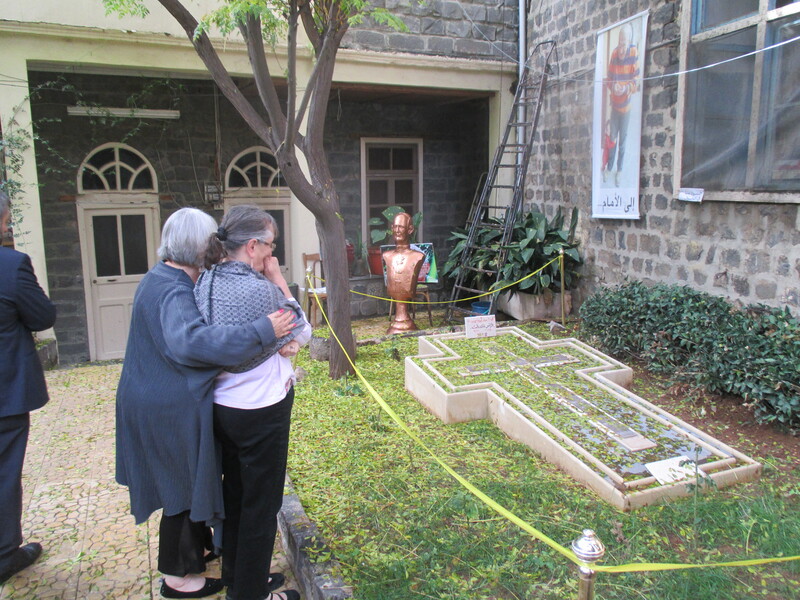 He also showed us the bronze bust in the courtyard of a former bishop, Athenosis, which had been welded back together after rebels had sliced it off. You can weld a head back onto a statue. You cannot weld the heads back on humans who have been slaughtered this way in this place. Jesus falls the third time. Jesus is stripped of his garments. The resting place of Fr. Frans vander Lugt, at the Jesuit Monastery in the old city of Homs, Syria. I heard his cries to remember these people on Youtube videos. He was shot in the head by rebels one week before the siege was lifted. We met Mazar, one of these faithful who tried to stop the murder but was pushed back. I embraced him on our way out and thanked him as best I could as we both cried tears of loss: me for a man I never met and Mazar for a man who had been his priest, his confessor, his comforter, his rock during this time. Jesus is nailed to the cross. Jesus dies on the cross. 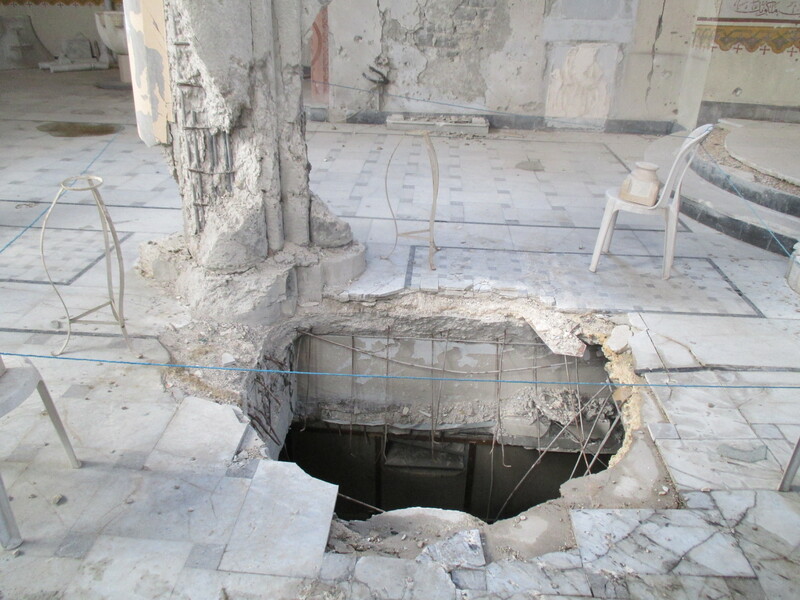 The crater left to the basement of Our Lady of Peace Melkite Catholic Church in Homs, Syria. This is where the pulpit used to be. At Our Lady of Peace, the Melkite Catholic Church, we heard the story of how it survived the bombs and mortars. It survived until three days later when a bomb wired to the pulpit from which the priest proclaimed the Gospel each week exploded and blew out all the doors, the stained glass, the iron framework of the huge dome overhead and created a crater to the basement. Father Abdullah calmly explained all of this as we looked through the metal frames which once contained the colored glass that bathed this space in a spectrum of light. Jesus is taken down from the cross. Jesus is laid in the tomb. Cross-shaped hole in the roof of the National Evangelical (Presbyterian) Church of Homs, Syria. 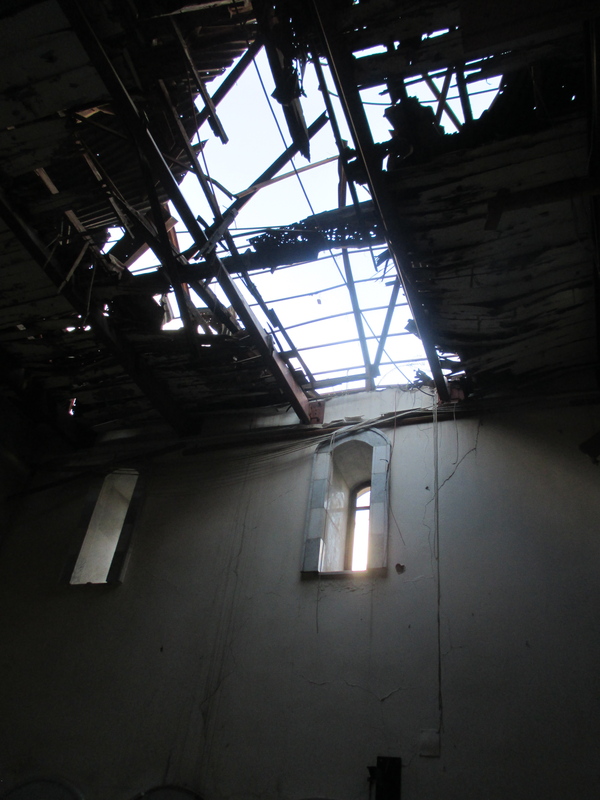 At the Evangelical Church of Homs, the entire youth group sang a hymn of praise for us in the sanctuary, below a cross-shaped hole blown into the roof, standing in puddles of water and mud on the floor. Two mosques on either side of this church were also blown apart. This war was a war on the entire city. A pilgrimage of prayer on holy ground. …resurrection always comes after crucifixion and we were seeing it before our eyes. That is the fifteenth station of the cross. Praise God. Powerful. I love the way it is framed in the Stations of the Cross. Faith is amazing, even in the midst of war- war of all kinds, not just bombings and terrorists-but even in the face of very personal war. Each just as damaging as the other, but with God, all things are possible. God is good all the time. All the time God is good. Dear Julie, I dropped on your blog while researching on destruction in Syria, I like your stories, especially the perspective of shearing and also pictures. Would it be possible to use some pictures for the church publication on destruction aiming to encourage to help? Thank you for reading my post. These were holy moments in Homs just over three years ago. I am happy for you to use anything you find on my blog as long as you give it the proper citation. Remember, this is not just a story about destruction. This is a hopeful story of people coming out of a long siege. I have been back to Homs twice since that blog, and those churches are working to rebuild, along with the rest of the city. Keep praying for them! God bless you.